The Bi-Partisan Budget Act of 2015 was passed into law on 11/2/15. It effectively phased out two Social Security filing strategies: “Restricted Application” for spousal benefits and “File-and-Suspend,” two commonly used methods for married couples. The good news is if you are already using one of these claiming strategies, the rule changes will not affect you. If, however, you are planning to use one of these strategies in the future, please continue reading. 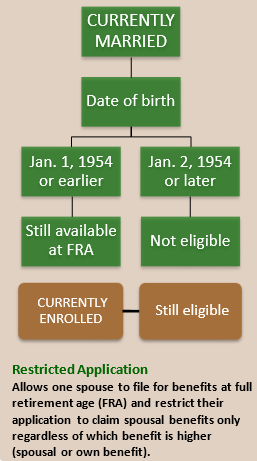 Filing a Restricted Application, if born on or before January 1, 1954, allows you to file for Spousal Benefits only at your full retirement age (FRA, age 66), while delaying your own benefits to a future date. Why do this? You can grow your own benefits by earning delayed retirement credits until age 70, at which time you can switch from Restricted to your own, larger benefit. For those born on January 2, 1954 or later, the new changes are applicable and you will not be eligible to file a Restricted Application. This means you will apply for your own benefits and spousal benefits at the same time and will receive the larger of the two. You may have heard this referred to as “deemed” filing. Currently, File-and-Suspend allows spouses and other beneficiaries to collect benefits based upon the individual filer’s wage earning records. Typically, the higher or primary wage-earning individual files for benefits at full retirement age (66), and then immediately requests a suspension of their own benefit. This then allows spouses and other beneficiaries to claim benefits while simultaneously growing the primary wage earner’s benefits through delayed earning credits. Beginning May 1st, 2016, spouses (and other beneficiaries) will no longer be able to collect benefits based upon the primary wage earner’s benefits – unless the primary wage earner has filed and is receiving checks on their own benefit. “Window Period – Now until 4/29/16”. If you are considering “File-and-Suspend” and you are the primary wage earner who will be at full retirement age (66) by April 29, 2016, you can use File-and-Suspend to preserve the payment of spousal (and other beneficiaries’) benefits. You must complete the application by April 29, 2016. Another reason to consider “File-and-Suspend” prior to 4/30/16, is that it will preserve the “cash reserve” option. 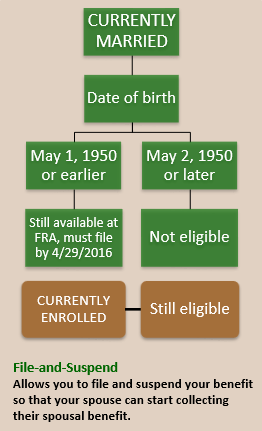 Let’s say a single or married person files and suspends their own benefit prior to 4/30/16 with the intention of delaying taking their benefit until age 70. Later, this person is diagnosed at age 68 or 69, with a serious medical condition that will result in a shortened life span. They then have the ability to change their mind and ask Social Security to retroactively “true-up” in a lump-sum cash payment, all of the foregone benefits back to their Full Retirement Age (66). The new monthly benefit going forward would be based on the benefit age of 66. After 4/30/16, this cash reserve option is eliminated. Conclusion – Please contact us if you are considering any of the above strategies to review your particular situation. We caution against automatically filing the File-and-Suspend method, as it may preclude you from having the option to file a Restricted Application on your spouse’s benefit at a later date. This entry was posted in Financial Planning and tagged social security changes, social security file and suspend, social security new laws, social security restricted application. Bookmark the permalink.